When new instruments and systems are designed in Research & Development laboratories, a large number of measuring instruments are necessary. Engineers and technicians responsible for designing electronic, computing and process control systems use a wide range of measuring instruments from the design phase through to the test and qualification phase. From the simplest to the most sophisticated and from single-function to multi-application products, Chauvin Arnoux® and Metrix® laboratory instruments offers users a broad choice, giving priority to effectiveness and accuracy. To meet these needs, Chauvin Arnoux's Metrix® brand proposes a set of simple but effective standard or programmable multi-channel power supply solutions and simple, random function generators. When used with the SX-GENE software, these function generators can simulate complex signals. 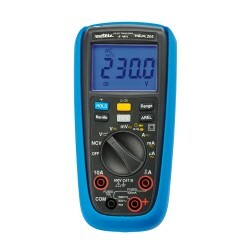 In addition, the advanced functions and accuracy of the benchtop multimeters in the MX5000 Series and the ASYC IV models allow users to measure the various electrical values of a circuit. With the Metrix® digital oscilloscope offering, time and frequency analysis is guaranteed in bandwidths up to several hundred MHz. Testing is now recognized as a specific profession which is crucial to the success of projects. It makes it possible to work on both technicalk and functional problems. Omnipresent throughout the development cycle, testing is an activity which draws on many types of knowledge and know-how, using reliable, accurate products. During this phase, tests are performed to check the system's performance and its ability to operate in its environment. For this, Chauvin Arnoux possesses suitable measuring solutions, in addition to the instruments already described. The multiple integrated functions of the Handscope and Scopix portable oscilloscopes with isolated channels mean they can be used for measurements on integration platforms. As they are simultaneously multi-channel oscilloscopes, multimeters, signal analysers (including of digital bus signals) and loggers, these instruments can be used to check and record the different points to be tested. Thanks to their communication interfaces and the related software, the measurements are collected and made available to generate the measurement report. During qualification tests, the assessment of heating on a printed circuit board with Chauvin Arnoux® thermographic cameras is essential for analysing the system's reliability. Similarly, the near-field probes associated with the MTX1050 spectrum analyser can be used for initial diagnostics concerning electromagnetic disturbance of a PCB. -The electrical insulation of the circuits, the consumption profile of a piece of equipment, the noise level, etc. -Recorders capable of tracing the changes in signals during characterization campaigns. Metrology laboratories constantly use measuring instruments to draft calibration reports or certificates: from multimeters to benchtop calibrators, from analogue oscilloscopes to digital models with bus decoding, etc. The ASYC IV multimeter constantly displays the measurement tolerance to facilitate measurement and compare the results with the qualification tests.